This is a continuation of a series of posts on the Fuji GFX 50S. You should be able to find all the posts about that camera in the Category List on the right sidebar, below the Articles widget. There’s a drop-down menu there that you can use to get to all the posts in this series; just look for “GFX 50S”. 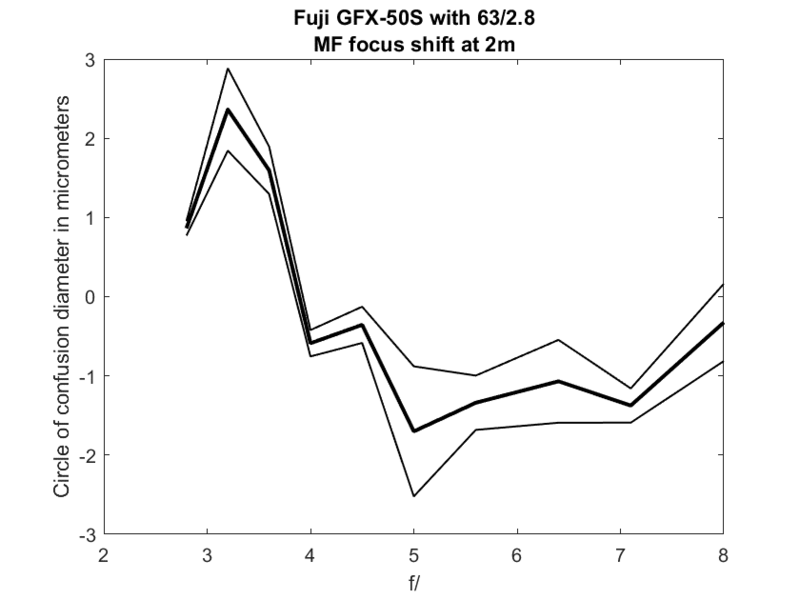 I couple of days ago, I published a study of the focus shift and autofocus errors of the Fuji GFX 50S using the Fuji 45 mm f/2.8 lens. Then I repeated the test with the 110 mm f/2. Now I’ll turn to the 63/2.8. 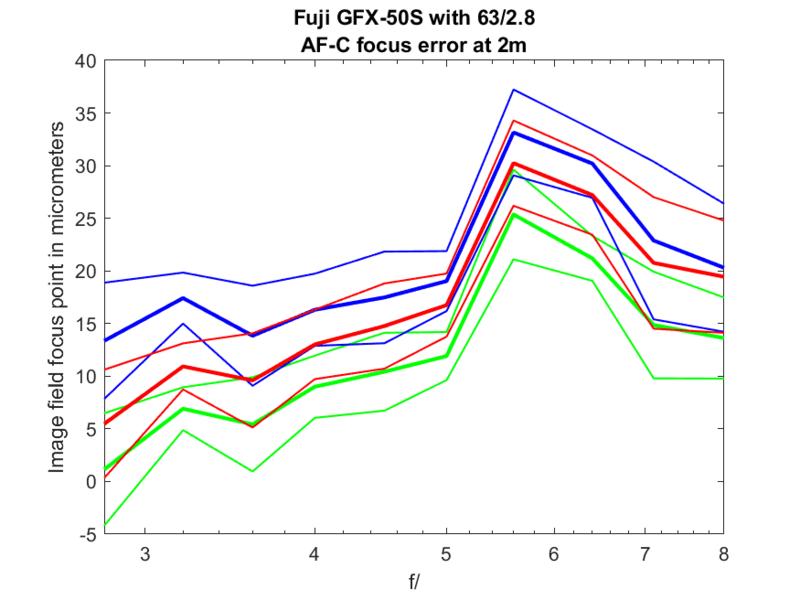 I’ve plotted the three Adobe RGB color channels. 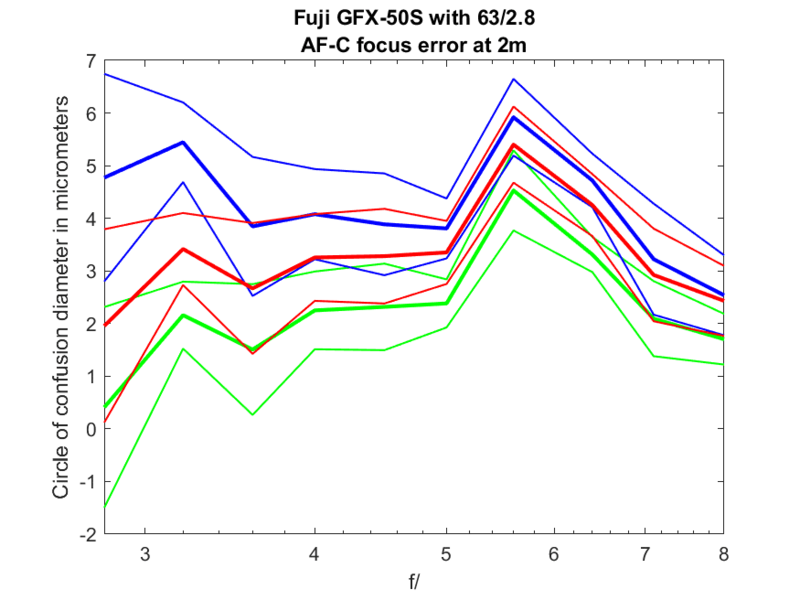 The graph presents displacement of the image projected on the sensor from the desired green-channel focal plane, not the error in the object field in front of the lens. 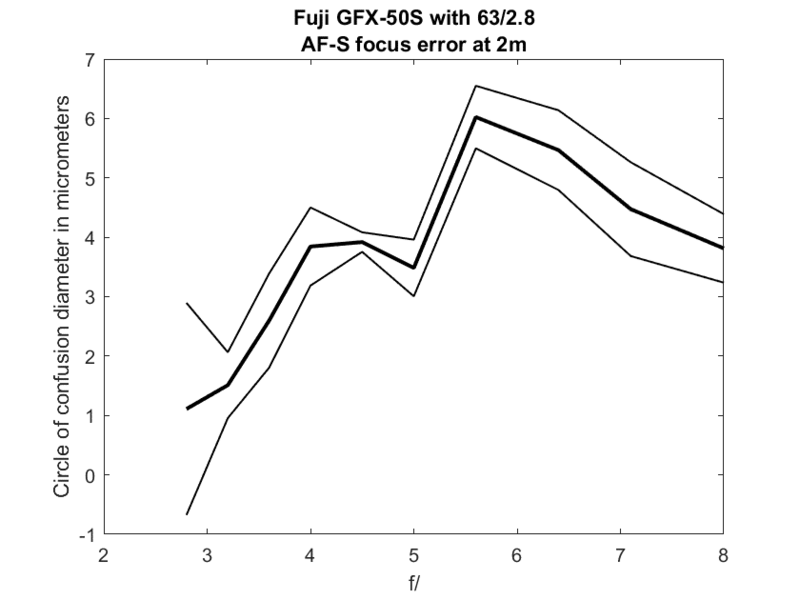 The reason for doing this is to allow easier comparison of lenses of different focal lengths at various target distances. 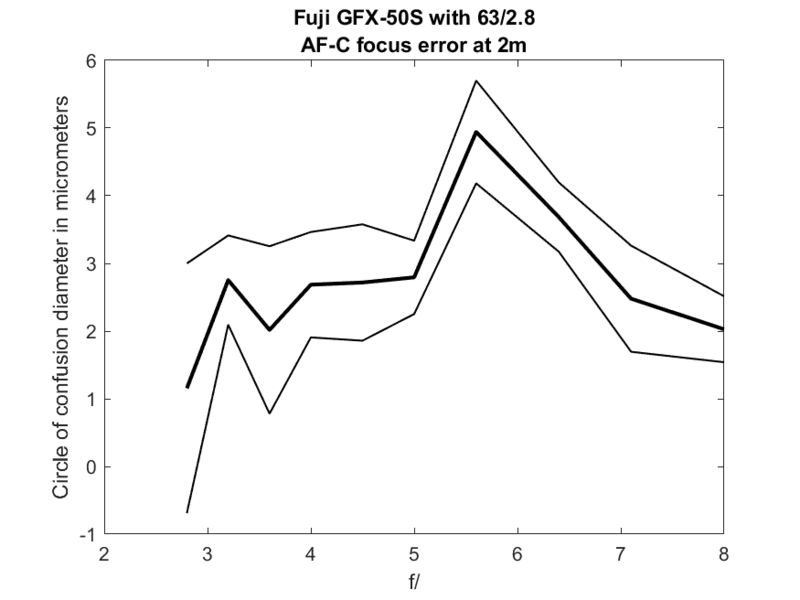 Negative numbers indicate front-focusing. 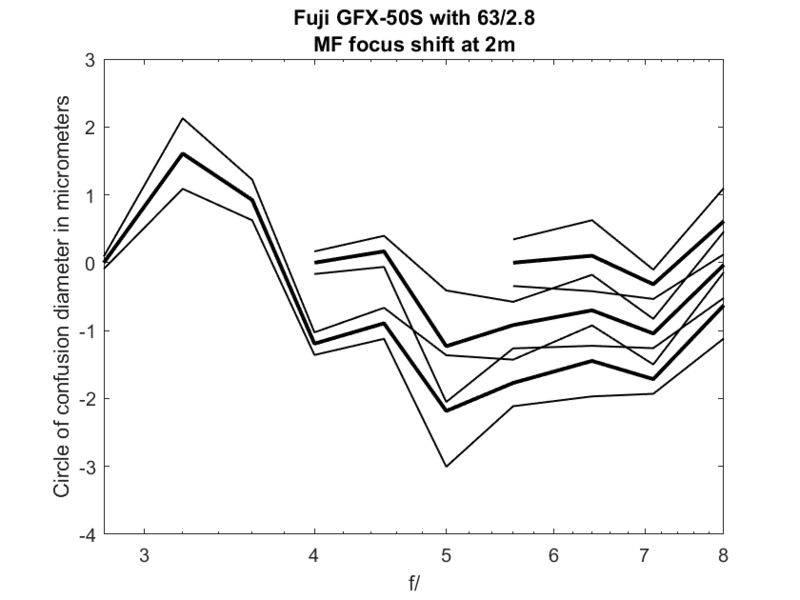 The image-plane shift is in micrometers (um). The separation of the focal distances of the three color planes is because of the longitudinal chromatic aberration (LoCA) of the lens. 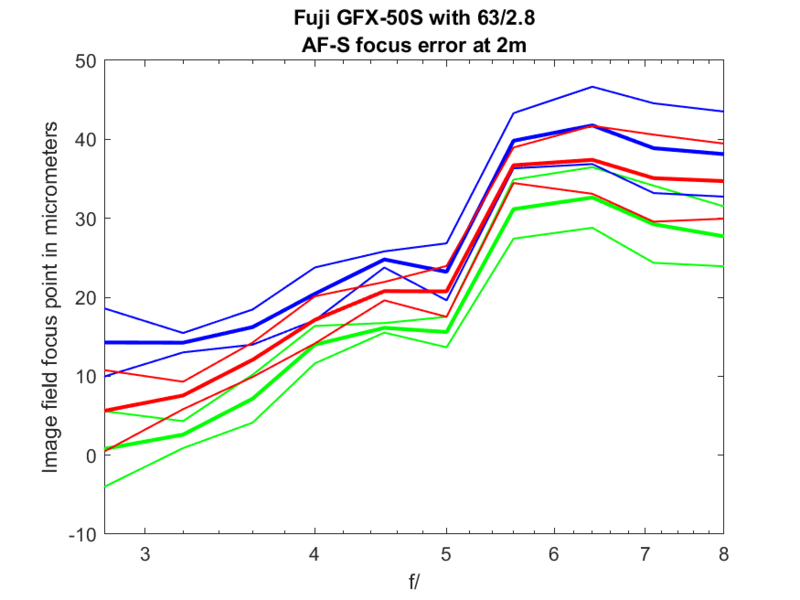 There were ten exposures at each f-stop. I’ve plotted lines indicating the average (aka mean or mu) of the sample set bolder and added thin lines above and below the means that are one standard deviation (sigma) away from them. 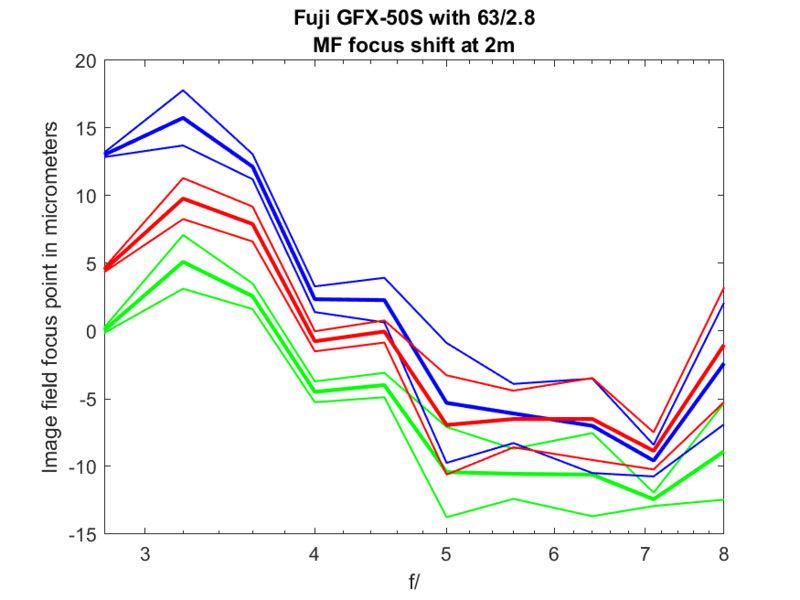 The focus shift is towards the camera as you stop down. 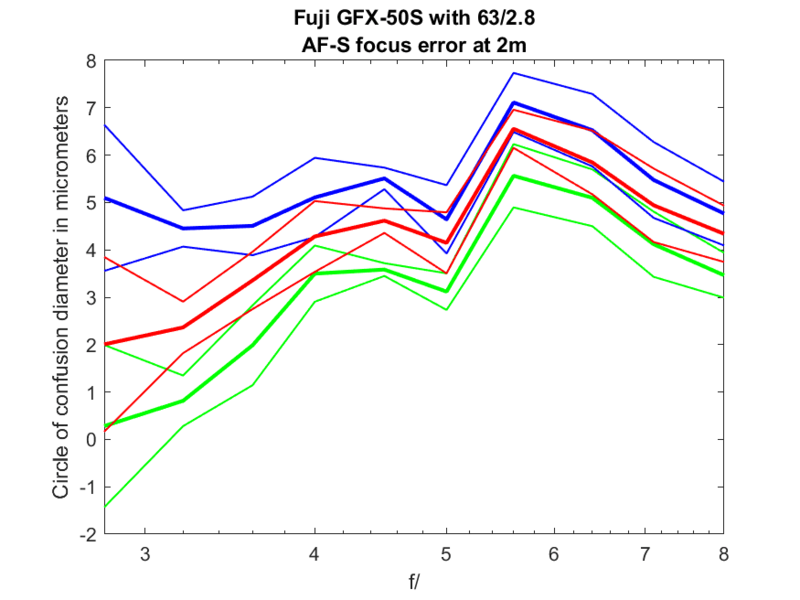 That means this lens is over-corrected for spherical aberration. The CoC errors are quite small. I wouldn’t have any qualms about focusing this lens wide open in most circumstances. This shows the blurriness that results from focusing wide open and then stopping down; that’s the set of curves that starts at f/2.8. The set that starts at f/4 shows what happens when you focus at that stop and then stop down, and the ones starting at f/5.6 show the same thing for that stop. 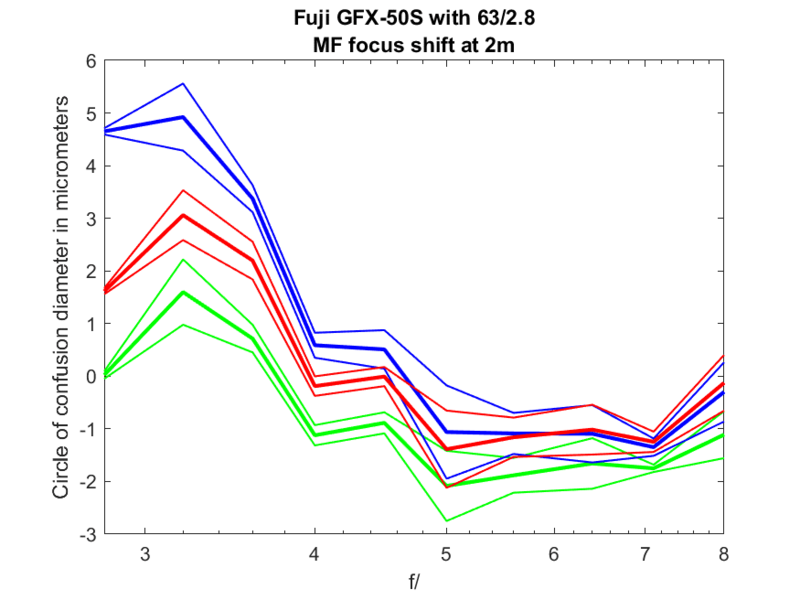 You can see that you gain a little by focusing at f/4 if you’re going to use that stop or a narrower aperture. Worst-case green channel errors are a bit over one pixel pitch. That is pretty darned good.